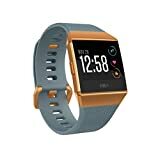 Compatible with Fitbit Blaze Smart Fitness. 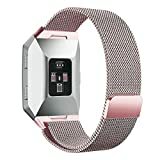 Package Included: Fitbit Blaze Milanese Loop watch band x1 FitbitCome with Quick Release Pins, Easy to replace or install your watch band, no tool need. Durable folding clasp ensure the Securely and Easily to lock or revome your watch band. 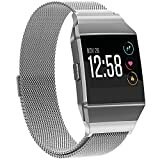 Secure locking mechanismPersonalized Your Fitbit Blaze Smart Fitness Watch with this refined classic replacement stainless steel wristbands. 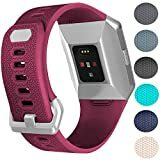 Features:Fashionable and casual watch band meets your fashion style.Many cute holes designed on the band, breathable.Silicone material, light-weight and comfortable.Hidden buckle, easy to close and take off.Standard adapters, quick and easy to install.Compatible for Fitbit charge 2 whose watch dial is 18mm.